About 15 miles east of Savannah, this is a wonderful rail trail, completed in 1999. It runs 6 miles from the Fort Pulaski National Monument, a colonial fort used by the Union Army during the Civil War, to Tybee Island, which features Georgia’s oldest and tallest lighthouse. The surface is crushed limestone. The trail itself was built as a railroad in 1887. The trail follows the south channel of the Savannah River with views of Cockspur Island across the channel. Start at the Fort Pulaski Visitor Center, and cross over the river on Fort Pulaski Rd. Follow the trail, heading west, about 6 miles to the end. The 9-foot-wide crushed calcide pathway is flanked by sprouting palm trees, 18 fitness stations, and 10 bridges, and assorted local fauna. There are mile markers along the way, as well as restrooms and an alternative parking area at about the halfway point. At the 4.5 mile mark, there are 7 exercise stations that stretch over the next half mile. At the end of the trail, there are great views of the western tip of Cockspur Island and in the distance the blue storage tanks on Elba Island. You’ll enjoy this run among the salt marshes! 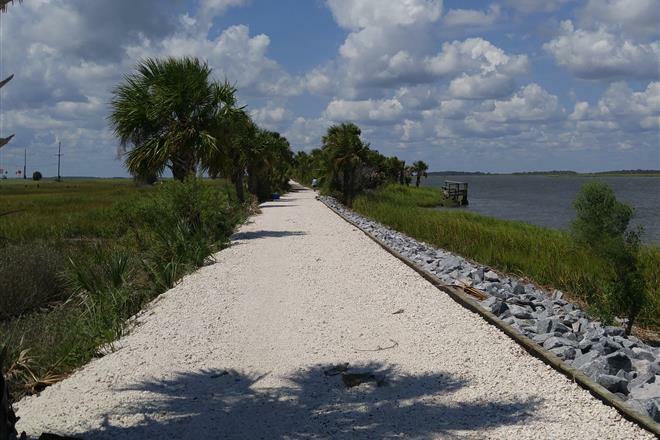 Add-Ons: Other trails for running and walking at the Fort Pulaski National Monument. One idea is the 4 mile RT out to the Fishing Pier (head east instead of west after crossing the river). Park the Fort Pulaski National Monument. The trailhead is off US 80 about 15 miles east of Savannah.